It is Wednesday, therefore I will share WIPs with you. If you are a new reader, a WIP is a Work in Progress. Whenever I manage to post about WIPs on a Wednesday I hook up to Tami's link party, which you can find by clicking the button at the bottom of this post. Involved in the link up are dozens of great crafters, all sharing their progress. It is really inspiring and I've found lots of great ideas for future projects, by looking at the other posters' blogs. To start off with, I have managed to finish the body of my Austin Hoodie. I have even managed to block it, as instructed in the pattern. It always amazes me how much of a difference blocking makes. The next stage is now to join the shoulders together using three needle bind off, and then knit the sleeves in the round. This really is a very interesting pattern and I am enjoying it very much. I have stalled a little on my hoodie project because I have cast on some of the Kidsilk Haze, I received. I decided to knit the Modern Quilt Wrap by Mags Kandis. I originally fell in love with this pattern a long time ago but knew I could never afford to make this lovely item. It uses 9 different colours of Kidsilk Haze!!!! If you know anything about yarn, then you know how much that would cost to buy. I couldn't justify spending that kind of money for any kind of knit, let alone a wrap. Recently, Susan Crowe shared her version, which made the project fresh in my mind for when I got my enormous bag of yarn. When I got this generous gift, I knew I wanted to make something really special, rather than lots of smaller projects. I wanted to make something as a kind of tribute to the knitter who had left this yarn behind. I looked at the colours I had, and knew that if I just added a couple of extra colours I could make a really lovely version of this pattern. I bought a couple of extra colours, a lime green and a teal, which meant that I have these 9 colours to use. They aren't the colours I would have chosen, if starting from scratch, but I think they will work ok. I cast on this project fairly quickly, after buying the yarn, and I have really enjoyed starting this project. I have decided that weaving in the ends, as I go, is a very good idea. I used this tutorial and it seems to be working ok. I have left the ends trailing so that when I block it, they don't get pulled out. After blocking the wrap, I will cut all the tails off. Until I do cut the ends, they are beginning to look like strands of multicoloured hair, as you can see from the photos! I have managed to finish the first row of blocks, and have started on the next row. I apologise for the photos. The light wasn't very good this morning, so the shots have been tweaked to within an inch of their lives, in order to get anything vaguely resembling the actual colours. All the striping in the blocks are different, so the colour changes keep you interested in what could be quite a dull knit. Well, it would be dull if I weren't using such lovely yarn. It feels like a soft cloud of gorgeousness! This knit will probably be quite a long term project, but it will be nice to pick it up and do a bit of a colour, here and there as a treat. I've also been chugging away at my Noro Ripple Scarf. I have now nearly finished the first skein, so I'm halfway there. I do love how the yarn has unwound and formed really nice stripes. This is another long term project, that I pull out and do a few rows here and there. I think it's nice to have a few long term projects on the go, that have no deadlines on them. Though, I admit, as it gets colder, I will probably be knitting more on both my wrap and my ripple scarf so I can snuggle up in them when I'm out on my scooter. It always amazes me how much the cooler weather makes me knit so much faster. 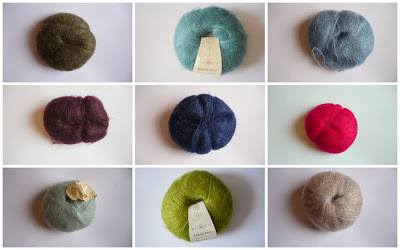 I think it is the pressing need to be wearing as much wool as possible!